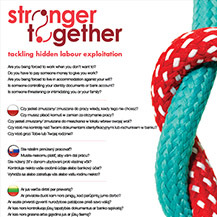 A printable A4 poster to inform workers about forced labour and where to report concerns. Minimum order of 10 posters. Additional designs available, please contact us for more information.